(Nanowerk News) NEC Corp. said Monday it will start a new service that will allow family members living apart to watch over each other utilizing a small robot and cloud computing technology. The 24-cm-tall robot weighing 1.3 kg is equipped with a camera, microphone and sensor so it can recognize and communicate with people nearby, NEC said. The Tokyo-based firm will offer the service as early as January in conjunction with other firms. Associate Senior Vice President Takemi Hosaka said at a news conference that NEC will launch the service in Japan first, but it eventually wants to expand overseas, including Australia. The robot, called PaPeRo petit, will be able to recognize images and voices by accessing recognition technology via the cloud computing service on the Internet, the company said. For example, the robot could be placed in a home where one family member is living apart from others. It would act as a conduit allowing them to communicate with each other, it said. A basic service like this is expected to be offered for less than ¥10,000 a month, the company said. 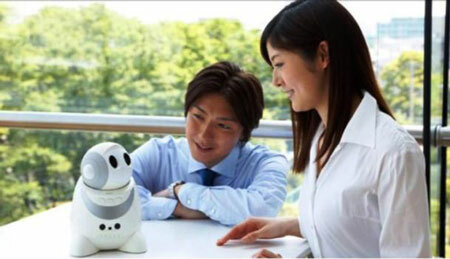 The robot can also be applied to such purposes as managing family members’ schedules as well as detecting suspicious individuals when family members are away from home. It can also be placed in shops, NEC said.